I've tried a few different support belts, and nothing compared with the Abdomend. The belt I wore during pregnancy was uncomfortable, itchy and didn't fit very well. The belt I wore post-C Section with the twins was also itchy and uncomfortable. As you can imagine, I very rarely wore either of these belts, even though I desperately needed the belly help. The Abdomend comes in two different types - one for C-Section recovery (pictured above) and one for post-vaginal birth (pictured below), however you can use the one for C-Section after a vaginal birth, during pregnancy and after any abdominal surgery. The one for post-vaginal birth you can also wear more than two weeks following a C-Section or other abdominal surgery as well as post-laparoscopic surgery. 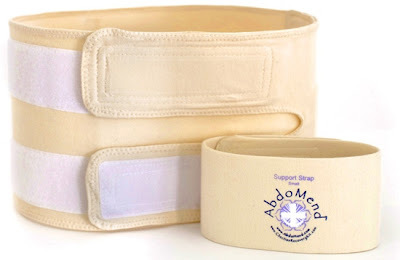 The Abdomend can reduce post-partum stress and pain and can help you to avoid post-surgery complications. It also helps to support and protect your incision, support your uterus and bladder, and generally speeds up your recovery. And the best part is that it also helps to tighten your tummy by using the ancient healing art of binding. Putting on the belt is simple, and the belt itself shows you in what order to wrap and secure the belt. You can also use the extra strap for an even greater amount of support. The sizing is generous enough that a medium sufficed, and I will still be able to use it when I lose this stubborn baby weight. It uses velcro to attach the belt, which is why it will grow (and shrink) with my body size. It also comes in several different sizes so women of every body type can use it! I'm looking forward to trying it out the next time I become pregnant to see if it will help support my growing belly. In the mean time, it's just helping me support the tummy I've got. The post-C Section band is $57.90 + shipping (for sizes petite - large) and $60 + shipping (for voluptuous). 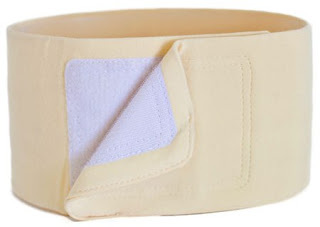 The post-vaginal birth band is $39 + shipping (for sizes petite & small) and $42 + shipping (for sizes medium - voluptuous). Overall: We give the Abdomend a 9.5/10! How would you like to win an Abdomend post-vaginal birth band (size large)? We were sent an Abdomend C-Section recovery kit free of charge for the sole purpose of this review; no other compensation was received. All opinions expressed are my own. I learned that the c section recovery kit not only provides support, but it also supposed to help with the appearance of the scar tissue. I learned that it helps to reduce post partum and stress. This product seems like it would be a miracle worker! I wish I would've known about it with my first child!!! Looks like something I'll definitely have to try!!! I learned that the compression belts can help reduce swelling and speed healing. I learned that it can "Accelerate Your Healing". Boy, I wish they had these when O had my son, and after my hysterectomy. They look very comfy! I learned that these belts facilitate healing while keeping mom comfortable. I learned that the size large fits a belly measuring 38"-50"
I learned that it helps with pain and speeds healing. "Subsequently most parents don’t know their baby’s DNA is being stored in a government lab, and maybe used in medical research." Creepy. I learned that the Government is at it again. When I first went to the site through me and I thought, "Oh this is if you have a C section." Then I went to FAQ and they said it isn't just designed for C sections but for support for your back in any situation that you need the support. Good to know! The whole page on what to expect after a c-section was quite enlightening!